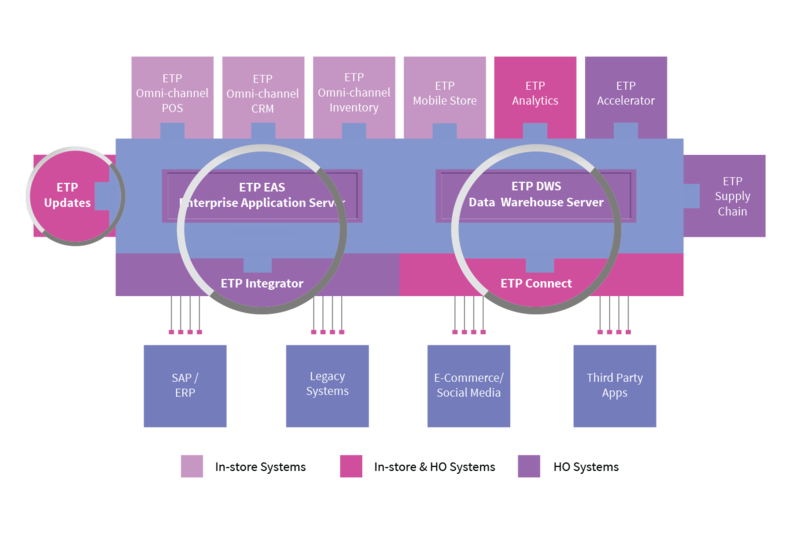 ETP Data Warehouse Server is the retail data management solution for the purpose of the enterprise performance measurement and planning. ETP Enterprise Application Server (EAS) performs the role of a central server at the head office. ETP Updates is a retail software management application which resides both centrally at the H.O. level and at individual stores. ETP Integrator is designed to integrate ETP V5 seamlessly with any ERP, Finance, HR, Manufacturing and other applications, services or databases. ETP Omni-channel Connect is a web services middleware which bridges the online and the offline world.